After another weekend trip to Cleveland, this time for the Scholastic Play-By-Play Classic, we at Triple Double Prospects feel like we’ve seen just about all of the top teams that Northeast Ohio has to offer. This past weekend, twelve of NEO’s finest took the floor on either Friday at Garfield Heights HS or Saturday at Baldwin Wallace University, with several of those games coming down to the wire. Cleveland catholic powers St. Edward’s and St. Ignatius were among the most impressive teams at the event, while Garfield Heights and Medina looked equally dangerous. Additionally, Mentor and Central Catholic might have lost, but they, along with a Shaker Heights team that struggled at times, showed no shortage of talent on Saturday afternoon. As for the individual players, here are some of the stars who stood out over the weekend…..
Ryan Badowski – ’14 SG Brunswick: A Division I signee headed to Longwood next season, Badowski got things started with a bang on Saturday morning as he exploded for 27 points in a win over Richmond Heights, making some tough perimeter jumpers off of the dribble in the process. A quick athlete that excels at shooting with limited space or from deep range, Badowski is one of the top scoring threats in all of Northeast Ohio, and is a threat to score as soon as he crosses half-court. Playing alongside fellow senior sniper Zach Parker, who tallied 28 points mostly on three-point shots, Brunswick has as efficient of a one-two shooting tandem as any team in the state. Marsalis Hamilton – ’14 SF Cleveland St. Edward: A bulky 6’4 forward with great strength, Hamilton was a monster in the paint and in transition for Ed’s on Saturday, as they blew out Mentor in a statement game to prove who the top team in NE Ohio is right now. Hamilton totaled 16 of his 24 points in the first half of play using his strength as a means to penetrate through the Mentor defense and finish at the rim. Still uncommitted, Hamilton is getting interest from both Division I and II colleges. Chelvonte Montgomery – ’14 SG Garfield Heights: The tough as nails scoring guard has always excelled on the defensive end and as a slasher, but during Friday night’s emphatic blowout over Cleveland JFK, Montgomery played a different role. That of a spot-up shooter. Montgomery is shooting over 45% from three on the season, and proved it was no fluke, as he calmly knocked down four long-balls with few misses. The lefty has taken on the challenge of improving his ball-skills to match his intensity for his senior season, and the results are starting to show as he is starring in his only season at G-Heights. Montgomery is another uncommitted senior who is considering both Division I and II schools. Jimond Ivey – ’14 SG/SF Glenville: One of NEO’s most exciting players, the 6’3 athletic wing can score, pass, handle it and really jump. Ivey was at times dominant on Friday in Glenville’s loss to Olmsted Falls, finishing with 13 points, however he had to sit the latter part of both the first and second halves due to foul trouble. A dynamic playmaker in transition, Ivey still might not have even touched the potential that he has on the offensive end. Montell McRae – ’15 PF/C Cleveland Central Catholic: The 6’8 defensive star played his normal game on Saturday, he just did so with a little bit more offensive efficiency than normal, as McRae helped keep the game close before CCC ended up losing a close game to St. Ignatius. An energetic floor runner with length and athleticism, McRae not only rebounded and blocked shots, but the skinny post player also finished around the rim with two-handed stick-backs or dunks. McRae is still very much learning how to play on the offensive end, but with his physical tools and the effort that he gives he has the potential to be one of Ohio’s best in 2015. Craig Randall – ’15 PG/SG Medina: A skilled, confident and talented scoring combo guard, Randall is enjoying his first season at Medina while putting up huge numbers. Just a few games removed from a statement outing at Garfield Heights, the 6’1 combo guard was at it again in a win over Warrensville Heights on Saturday night. Randall can hurt you in many different ways offensively as he mixes elite shooting ability with lefty floaters, some highlight passes and a dribble package that allows him to use his quickness to get separation for his shot. 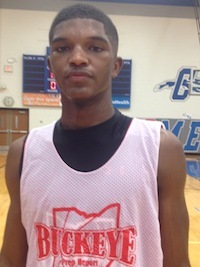 Being recruited heavily at the Division I level, with some mid-major offers on the plate, Randall has long been considered one of the top 2015 guards in Ohio. Esa Ahmad – ’15 PF Shaker Heights: Ahmad continued his campaign for a Mr. Basketball trophy during Shaker Heights’ overtime win against Cleveland Heights on Saturday evening, totaling 26 points and 20 rebounds in the win. While some have complained that Ahmad focuses too much on playing on the perimeter, the results of his skill-workouts are obvious as the 6’8 power forward has really become a deadly shooter all the way out to three-point range. A smart, tough and versatile scorer, Ahmad is not just consistent with his rebounding but also in his ability to put the ball in the bucket, evidenced by the numbers he’s put up this season, as well as the high major schools recruiting him such as Xavier, Miami (FL), Rutgers, West Virginia, Clemson and Dayton. Kipper Nichols – ’15 SF Cleveland St. Edward: With the team effort that Ed’s gave on Saturday it’s tough to identify a player or two who starred, but in addition to what Marsalis Hamilton provided in scoring, junior forward Kipper Nichols provided in overall efficiency early in the game. Nichols set the tone early, scoring eight of the first ten for Ed’s on his way to an 18 point game. Nichols is another versatile offensive player who can shoot in the mid-range, handle in the open floor, finish around the rim or distribute, but is perhaps most comfortable as a scorer on the block where he can use his 6’6 frame and superior strength. A hard-nosed player who really competes on the defensive end and has the physical tools to guard different positions, Nichols has emerged as a priority recruit at the mid-major level, especially by several MAC programs. Willie Jackson – ’16 SF Garfield Heights: An athletic 6’6 combo forward who is slowly developing into more and more of a skilled basketball player, Jackson’s game absolutely screams potential in 2016. Another hard-nosed kid, and a truly elite athlete, Jackson has put time in the gym to focus on his ball handling and shooting form, with results slowly coming around. Jackson has all of the ability to dominate the game at the high school level, and put together an impressive performance on Friday night with 22 points in limited minutes as G-Heights rolled to a fifty-point victory. Deven Stover – ’16 SG/SF Cleveland St. Ignatius: Much like St. Ed’s (their fierce rival), it’s tough to identify who the best player on this season’s Ignatius team is. We wouldn’t go as far as to call Stover a high school star at this point in his career, but it is certainly possible that the talented sophomore has the most potential of any player on the Iggy roster. An energetic athlete with good strength and knack for finishing tough shots around the basket, Stover is able to give Ignatius a slashing threat that they don’t really have when he is on the court. He’s not the best shooter yet, but Stover’s all-around game and IQ are coming along under the guidance of the legendary coach Sean O’Toole, and Stover is showing clear progression as he gains experience. Jon Teske – ’16 C Medina: While Randall and senior power forward Brandon Wilkins provide most of the scoring on a very good Medina squad, it is the interior presence of the 6’10 sophomore, Teske, that takes the Bees to the next level. Teske is a smart defender who knows how to use his size to disrupt players on layup attempts, and he also does a nice job of not fouling. While he is still developing strength, Teske is also a skilled offensive player with nice touch on his inside finishes and mid-range jumper. He still has plenty of work to do, but his size and talent have made him the target of some pretty impressive programs, including Indiana and Purdue, already.